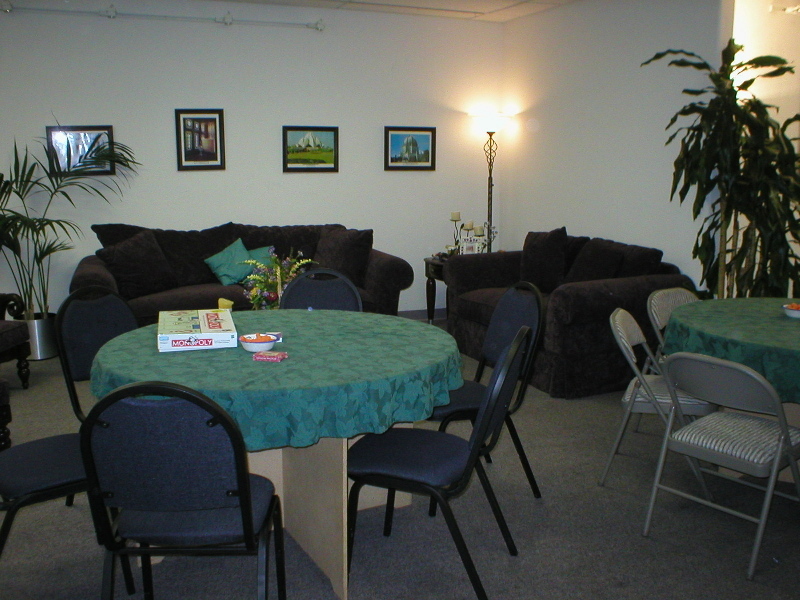 Bahá’í communities usually acquire centers because their members can no longer fit comfortably in homes. 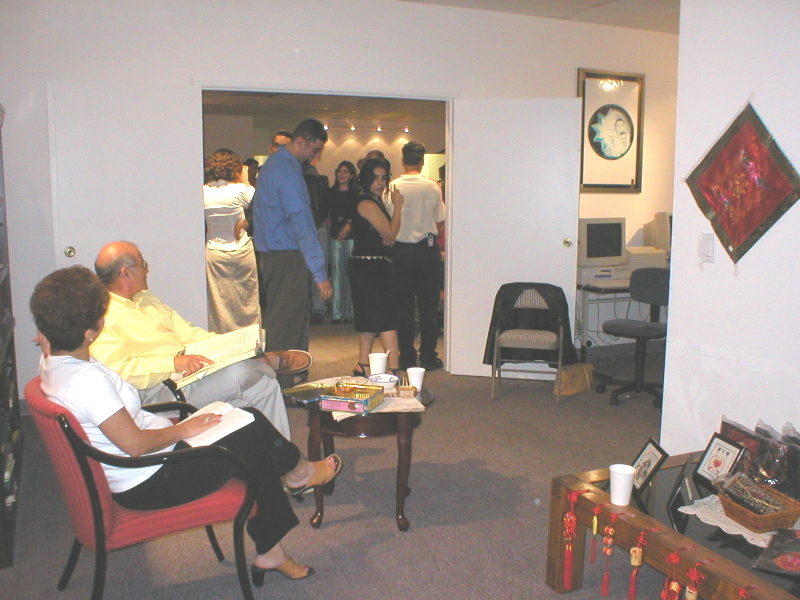 But the San Diego Bahá’ís outgrew homes long ago and already owned a center when they decided to rent some office space behind a shopping plaza in June of 2000 and call it the Unity Center. Then again, the Unity Center is no ordinary Bahá’í center. Its official definition is “a community service project under the direction of the Local Spiritual Assembly of the Bahá’ís of San Diego.” Whereas the main San Diego Bahá’í Center on Alcala Knolls Drive is home to the major administrative activities and official gatherings of the community, the Unity Center is a more casual space dedicated to promoting fellowship among Bahá’ís and offering the non-Bahá’í public a neutral place to associate with their Bahá’í neighbors in a relaxed atmosphere. 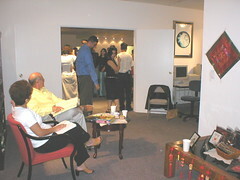 For example, social dancing would not be appropriate in the main center where worship services are regularly held, but it is allowed at the Unity Center. The Unity Center is located in office space on the back side of a shopping center. The center is two miles east of I-805 and three miles west of I-15. From I-805, take the Miramar exit and travel on Miramar Road, past the large pyramid-shaped building, until you reach Production Rd. Turn left on Production (you should see a Starbucks on the corner) and take your first right into the shopping area parking lot. Please refer to the Photographs section for a picture of the main entrance. 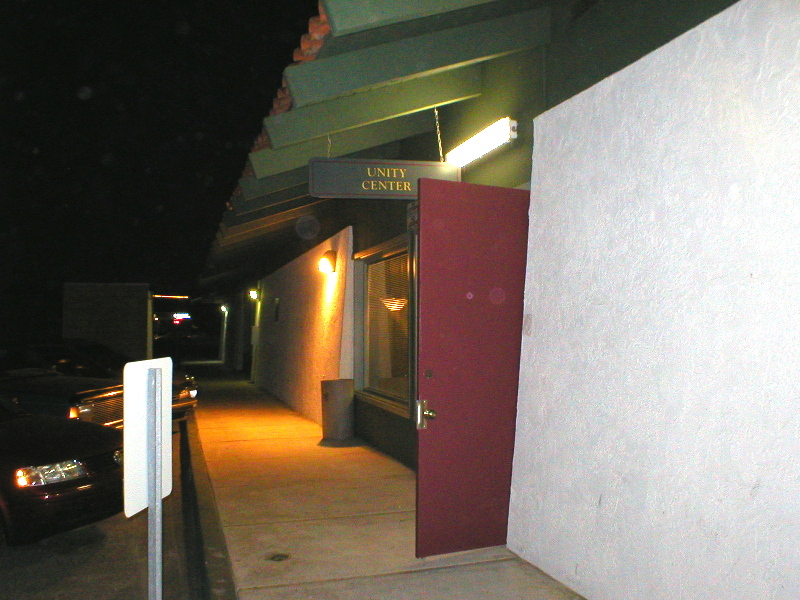 The Unity Center sign may be difficult to see at night. From I-15, take the Miramar exit and travel on Miramar Road, past the pyramid, until you reach Production. Turn right on Production and right into the first parking lot. The Unity Center currently holds seven regularly scheduled activities. 7) Open House: socialization with refreshments, entertainment, and games Individual Bahá’ís are free to schedule one-time events or propose other regular events at the Unity Center. For example, as a result of an individual suggestion the task force in charge of scheduling is considering plans to open the center for socializing on a regular basis to military families from the nearby base who seek a way to become involved in the greater San Diego community. People who aren’t Bahá’í or don’t live in the area are also welcome to use the center. In a few months the center will host its first wedding. 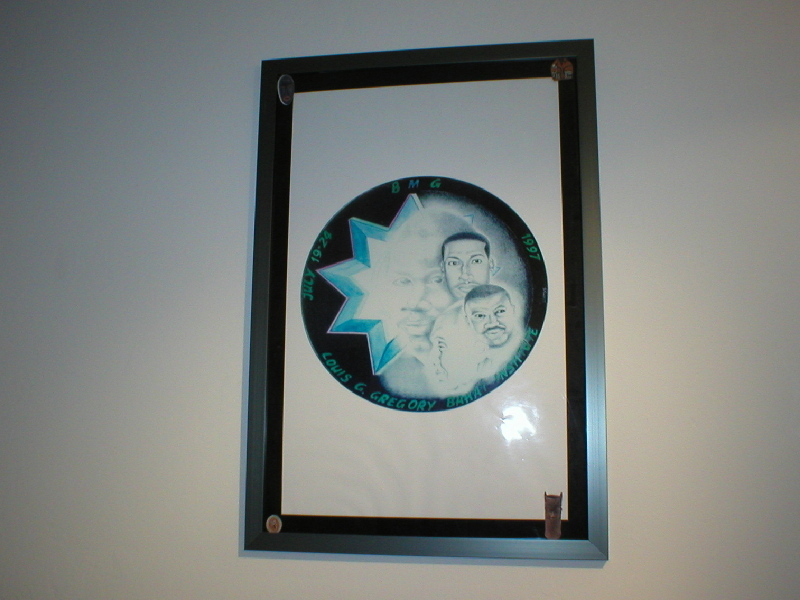 The facilities may also be used to house a traveling delegation from the Bahá’í Black Men’s Gathering, an annual event where African-American Baha’i men encourage each other spiritually and otherwise. The Unity Center is, before anything else, a servant to the Bahá’í community and greater San Diego community. This clear mandate to serve explains why the task force is so open to hosting diverse activities. Because the needs of the community are constantly changing, the center must remain alert and engaged with its constituency in order to most effectively meet their needs. Visitors are very welcome. As with any Bahá’í center, it is best to call ahead of time to make sure that you understand the nature of the activity you want to attend. There is no official dress code other than general cleanliness and modesty, but events which are specifically geared toward Persians or happen to be mostly attended by Persians tend to have a relatively formal unspoken dress code. 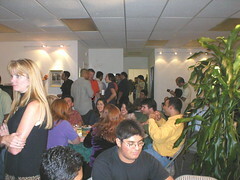 One of the Unity Center’s most useful qualities is its ability to adapt to suit any social situation. Whether dotted with card tables to encourage small discussions or stripped of most furniture to create a dance floor, lined with rows of chairs for a lecture or strewn with toys to occupy young children, the center yields gracefully to any circumstances and always looks appropriate for the occasion. The front door leads into an expansive area scattered liberally with all the accoutrements of a cozy family room– couches, soft chairs, flower arrangements, potted plants, coffee table books, assorted lamps and the like. To the right of the main room lies a sitting room with all the fixings for mellow entertainment. 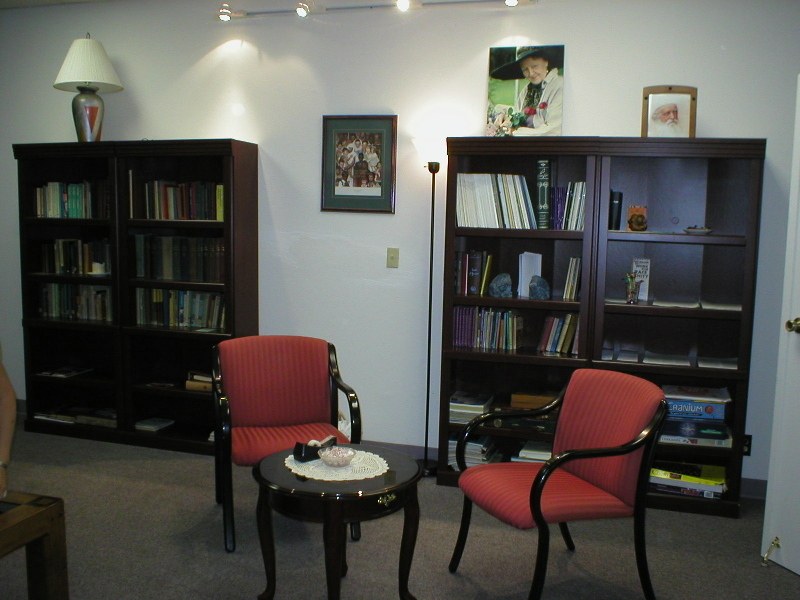 Several bookcases offer titles as diverse as The Teachings of the Compassionate Buddha, Paton’s Cry, The Beloved Country and a thick edition of The Physician’s Desk Reference. There is also a good portion of one bookcase dedicated to Persian literature. 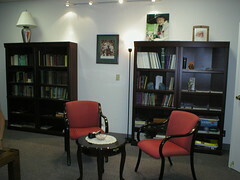 Other features of the sitting room include two computers, a bulletin board, photos of notable figures in the Bahá’í Faith like ‘Abdu’l-Bahá and Rúhíyyih Khanum, and a display of ethnic tapestries. Whereas the sitting room offers a comparatively sedate option to the social events in the main room, a tiny enclave at the other end of the building is home to possibly the most raucous activity: foosball. Beyond the Foosball Room there is a meeting room with a large dining table and beyond that, a kitchen and administrative office. The Unity Center does not have a caretaker or office manager. Instead, a task force of three Bahá’ís share the center upkeep. One person is in charge of finances and repairs, another attends to the indoor plants and other matters of interior upkeep, and a third handles event scheduling. The center has experimented with different modes of administration including larger task forces and various committees and will likely continue to try out new ways of delegating responsibility in the future. As a project under the direction of the Local Spiritual Assembly of the Bahá’ís of San Diego, the Unity Center should serve roughly the same community as the main San Diego Bahá’í Center. In reality, perhaps because it offers several programs geared specifically for Persians or because of its collection of Persian language reading materials, many Unity Center activities are largely Persian.